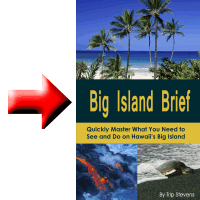 What Should You Eat on the Big Island? Your Big Island vacation is not complete without tasting some of the unique foods of the Hawaiian islands. Most of the following foods listed are not specific to the Big Island. They can be found on most of the Hawaiian Islands, but trying them while on the Big Island will add a little more spice and flavor to your Hawaiian vacation. 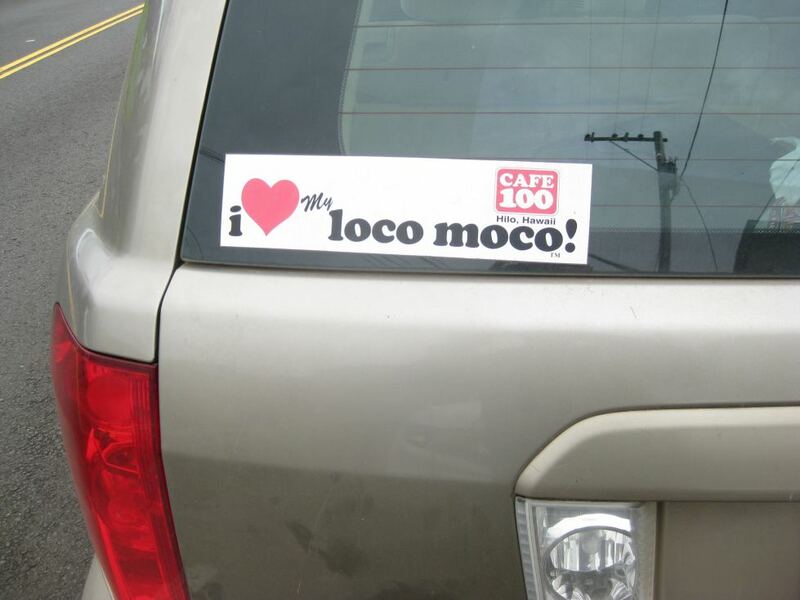 Moco Loco – The Moco Loco is probably one of the most well-known dishes on the Islands, it is well worth mentioning again—especially if clogged arteries are of no concern. The Moco Loco is a fried egg on top of a fried hamburger on top of a pile of rice. Then, to round out the dish, the entire mound is smothered in gravy. These crafted creations are served all over the island but the most iconic place to get them would be at Cafe 100 in Hilo (969 Kilauea Avenue). It gets very busy there at noon and they are closed on Sundays. Shave Ice – This is not a misspelling of “shaved ice” as used elsewhere. You may already be familiar with the classic snow cone, which consists of crushed ice and some syrupy goo squirted on top. On initial inspection, shave ice looks a lot like a snow cone, but the similarities end at the icy appearance. 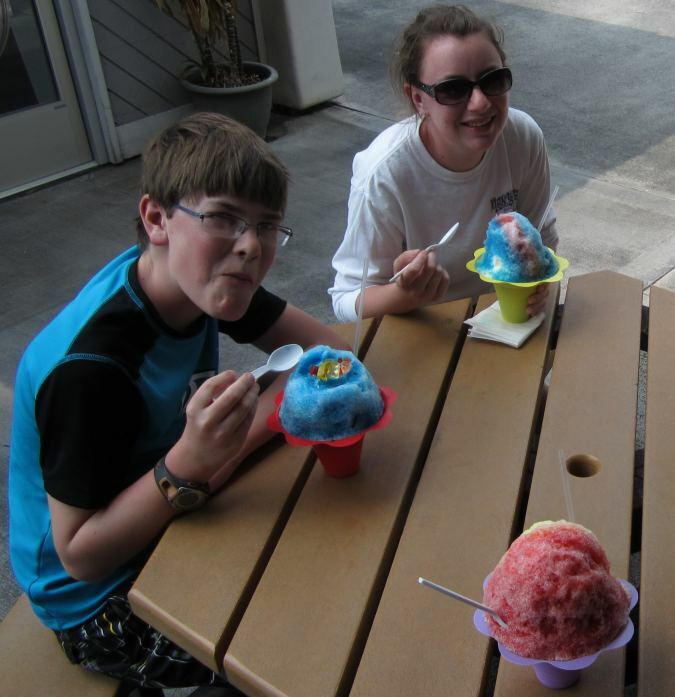 Shave ice is a popular Hawaiian treat that consists of finely shaved ice—much finer than that found in a snow cone. Because the ice is much finer, the flavored syrup tends to reside between these fine ice crystals rather than settling at the bottom of the cup. Flavors for shave ice are typically Hawaiian in nature—pineapple, guava, and coconut—although you can still get the standard fare of strawberry, bubble gum, etc. For an added treat, get a scoop of ice cream in the bottom of your cup or cone. A great place to try shave ice is Scandanavian Shave Ice (5699 Ali’i Drive). Kalua Pork – Kalua means “to cook in an underground oven.” The most common place to get your Kalua pork would be at a luau, but you can find it around the island at different restaurants. Cooked right, it is very tender and very tasty. Spam – Really, Spam? In Hawaii? Yes, Spam is a Hawaiian favorite and you probably won’t have to look far to find it. I found it in many different permutations in the grocery stores, and I found it cut up finely in a bowl of saimin that I ate in Lihue on Kauai. On one trip to Oahu, I ate at McDonald’s and saw several different options to order Spam and rice. The first time my son ate Spam was in Kauai. He loved it and I told him that it was sold only in Hawaii. He believed me but I was busted a few years later when he spotted it in the local grocery store back home. My favorite way to consume Spam in Hawaii is Spam musubi. 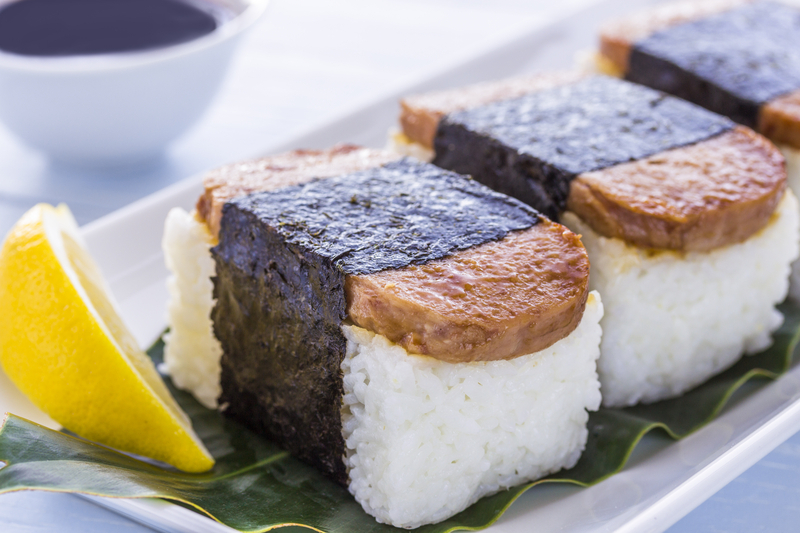 Spam musubi is composed of a slice of grilled Spam on top of a block of sticky rice, wrapped with nori (dried seaweed). Macadamia Nut Pancakes – This is the basis for the great Hawaiian breakfast. You can get them served with bananas or pineapple and some coconut syrup. POG – You won’t have to look too far to find this either. 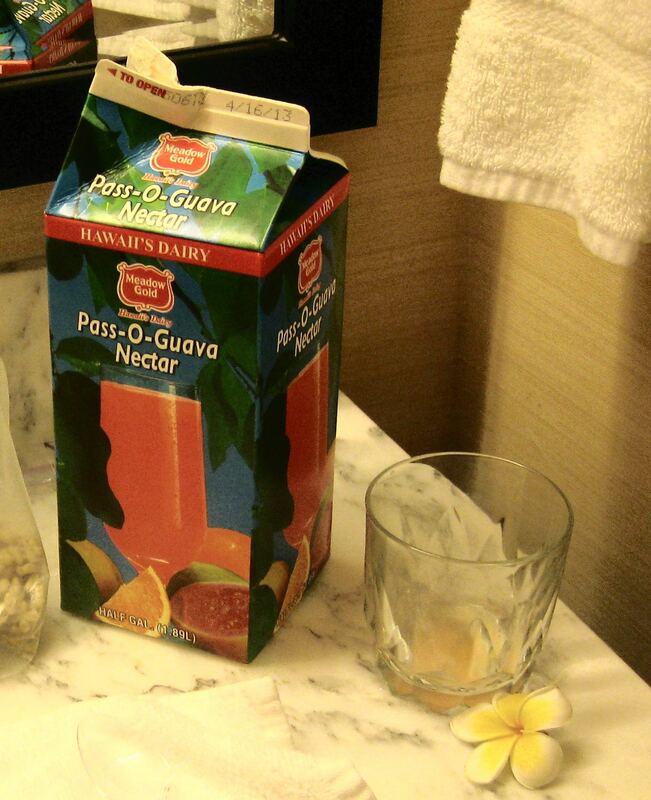 “POG” stands for passion fruit, orange, and guava juice. It is served everywhere. I got a carton of it once when flying from Maui to Kauai on Hawaiian Airlines. It’s probably not the most amazing drink you will ever consume, but it is good and very Hawaiian. If you don’t stumble upon it in your normal travels, you can pick it up in any grocery store. Ono – Also called “wahoo,” ono is a mild-flavored fish that does not taste “too fishy.” Ono is related to the king mackerel, and is served in most Hawaiian seafood restaurants. Hawaiian Sweet Bread – Just the sound of this very soft, very sweet bread makes my mouth water. It is like Wonder bread, only 100 times sweeter. My wife, who won’t let the kids eat Wonder bread, approves of this. My family can devour a loaf in minutes. 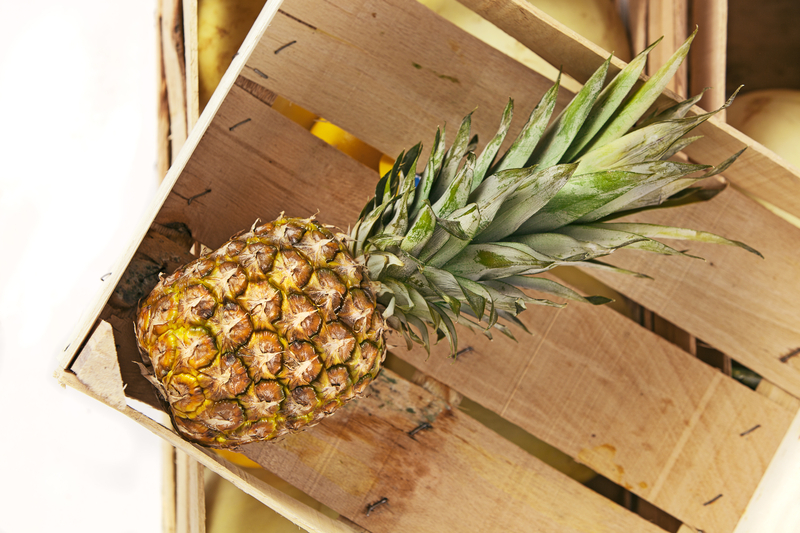 Maui Gold Pineapple – If you like pineapple, you should try the Maui Gold pineapple. They are sweeter and lower in acidity than the typical pineapple and are easy to find at the local grocery stores like Safeway and Foodland. If you decide you want to take one home, you can buy them in the airport—which is your best bet because they will be packed and agriculturally inspected.